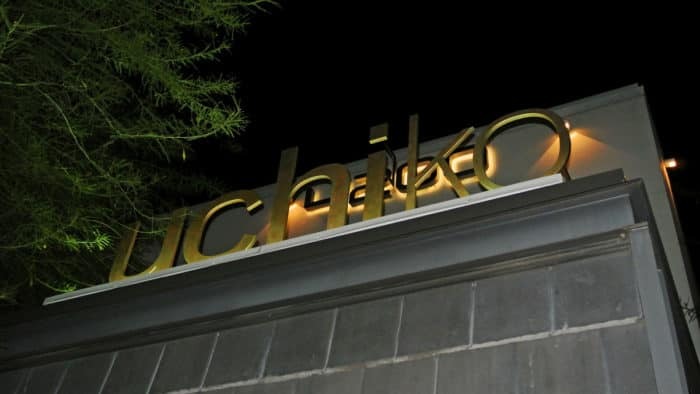 Everyone that’s even partially aware of the Austin dining scene has heard of Uchiko. It’s generally regarded as one of the top dining destinations in the city and I’ve known for many years that I needed to see what all of the excitement was about for myself. I think the restaurant may have actually first come to attention when the now-famed chef Paul Qui tore his way through Top Chef Season 9. He basically wiped the floor with his competition utilizing his signature Asian fusion style and I took notice. Paul has since moved on from Uchiko to work on other Austin ventures such as his food truck East Side King and namesake restaurant Qui. But, Uchiko remains as exciting and buzz-worthy as ever. On this particular trip to Austin, my family was in town from New York. I had already taken them on a tour of amazing eateries serving a wide range of food styles in a variety of atmospheres. From traditional Texas-style BBQ in the middle of nowhere to over-the-top, deep-fried food truck madness at Hey, You Gonna Eat or What? 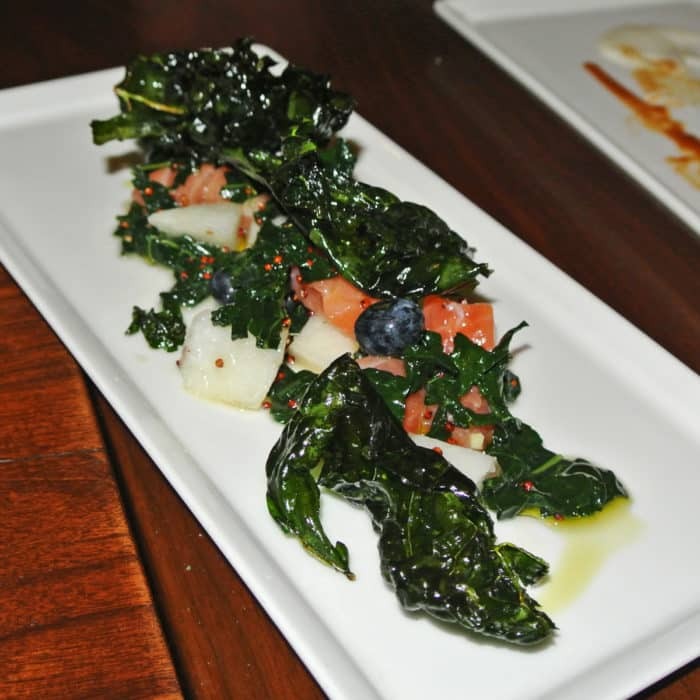 to tapas-style, upscale, interpretations of Southern cuisine at Odd Duck – they loved it all. But, I somehow knew that Uchiko’s lighter, Asian-fusion stylings were destined to become their favorite of the bunch. 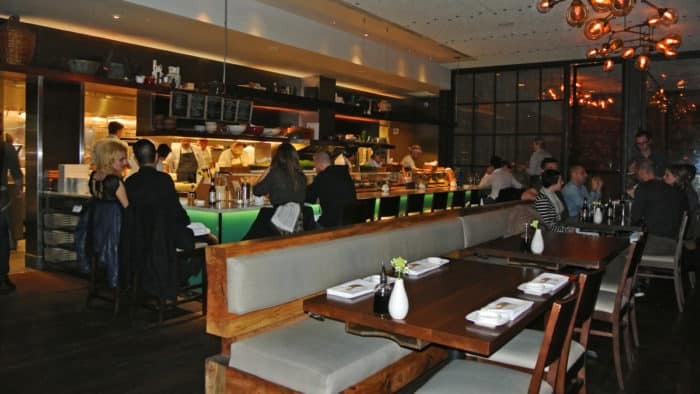 Uchiko’s menu has a relatively expansive menu divided into sections of greens, cool tastings, hot tastings, yakimono (pan-fried), agemono (deep-fried), sushi, sashimi, and makimono (maki sushi rolls). Their sushi and sashimi offerings are extensive, especially for Austin, and even includes high-end imports flown in from Japan’s famed Tsukiji Market just like at San Francisco’s best sushi restaurants. But, it’s beyond the simple, sliced fish where you’ll want to focus your attention. Despite nearly every dish’s Japanese grounding, there’s always going to be some sort of unique twist – an innovation that elevates the otherwise simple and humble creation to become something much more memorable. Fortunately, my family gave me the reigns to order plates for the entire table of six which gave me the opportunity to sample a large variety of their most interesting dishes. Buckle up – we ordered a lot. 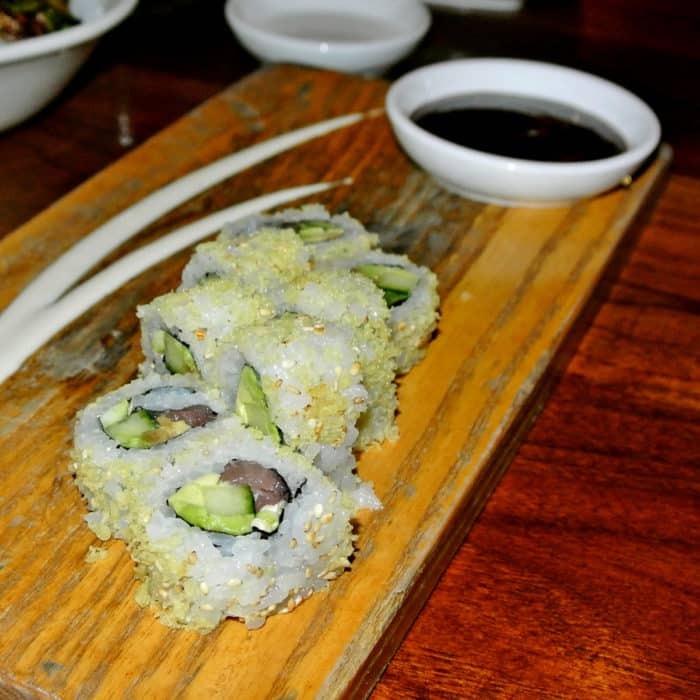 To kick it off, we started with a bit of sushi – the first of which was called P-38. It involved Japanese yellowtail, avocado, yuzu kosho, grilled negi (scallion), and cilantro and was really quite delicious. The closest thing I could compare it to would be a classic Negi Hama roll, though this one was about a million times better and more interesting. The quality and freshness of the yellowtail was outstanding and impressive. And the grilled negi added a toasty, oniony flavor whereas the cilantro contributed an interesting herbal quality to the dish. The yuzu kosho, a strange Japanese condiment, added such a really unique citrusy edge to the whole thing. This roll was a perfect example of the kind of simple dish these chefs have tweaked, refined, and perfected to create something completely unique to Uchiko. Next up was an Asian riff on ceviche called Yokai Berry involving Atlantic salmon, dinosaur kale, asian pear, and yuzu. There was such a wonderful balance of flavors in this dish. Between the sweet fruit, fresh raw fish, earthy leafy kale, mustard seed punch, and bright yuzu citrus, it all came together incredibly well. 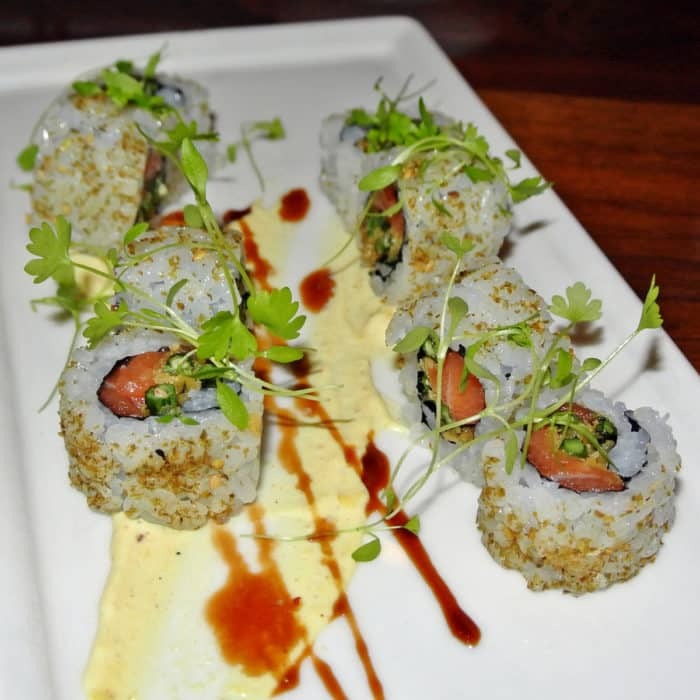 The Crunchy Tuna roll was another simple dish executed impeccably. The big eye tuna was extraordinarily fresh as was the sliced avocado, jalapeño, and english cucumber. And the crunchy tempura crisp-sprinkled exterior and creamy aioli tied all of these separate elements together. Then it was time for the Brussels Sprouts. 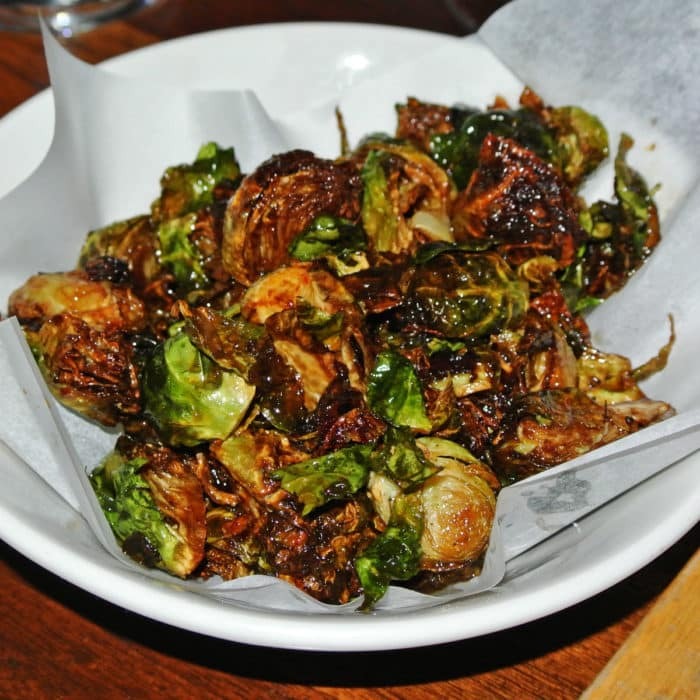 I have had a hell of a lot of fancy Brussels Sprouts recently and many of them have been outstanding, but this version at Uchiko can stand right next to the best of them. These Brussels halves were wok-fried really well which imparted a crispy, smokey flavor that was amplified by the pool of sweet, sticky, funky fish sauce caramel beneath. A squeeze of lemon and sprinkling of spicy chili served as a nice balance to the dish’s in-your-face umami funk. Next, we had a simple-sounding sushi roll called Sake Maki. But, as if you haven’t figured it out yet, simple-sounding is never that simple at Uchiko. This roll involved rolling incredibly fresh, buttery raw salmon and crispy fried tempura green beans into flavorful, freshly-steamed, forbidden rice. This fully assembled roll was dressed with a sprinkle of spice, a swipe of kewpie mayo, and a traditional Japanese sauce called nikiri – a sort of sweet soy glaze designed enhance the fish’s natural flavors. 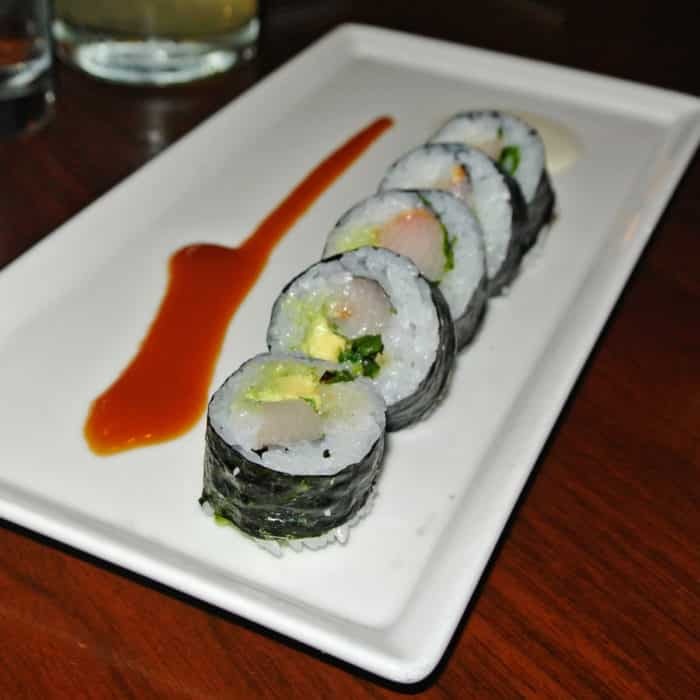 Our waiter explained that there was no need for dipping soy with this roll, and he was right – there’s that unique twist again. This stuff was incredible, really. We then enjoyed another take on ceviche called Hama Chili. This one involved large slices of Japanese Yellowtail that ranged in tone from white to pale pink and was swimming in a bowl of garlicky, Thai chile and orange-spiked ponzu. 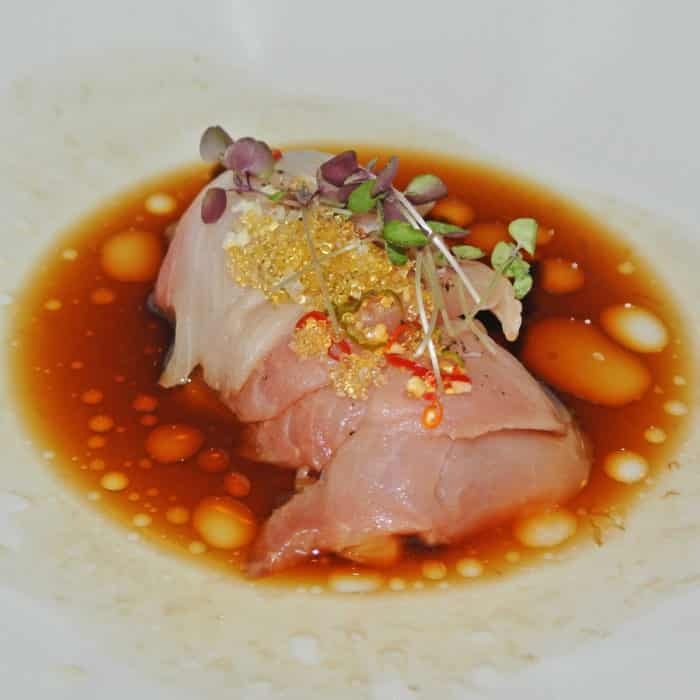 The dressing was quite bold, but still allowed the featured ingredient – the yellowtail – to shine to its fullest. This dish was another winner. So, up to this point in the meal, most of the dishes we can ate could be classified as relatively traditional with only delicate tip-toes into unusual territory. That was also the exact moment when our meal took a turn for the weird (and amazing) through some of Uchiko’s wackier must-order creations. The next dish we dug into was called Hot Rock – seriously. 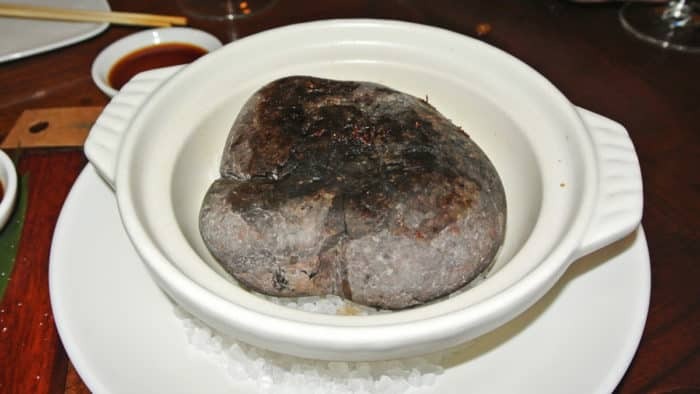 When this dish was brought to our table, the first thing to arrive was be a humongous, smooth, grey, Japanese river rock seated in a white ceramic bowl over a bed of large crystal rock salt. This rock came with a stern verbal warning, because it had been oven-heated to obscenely hot temperatures for the next step in the interactive cooking process. Then, a few moments later, a plate of insanely high-quality, ridiculously fresh, thin-sliced, lightly salted, wagyu beef sashimi was brought over. We followed the waiter’s “sear it yourself” instructions and carefully laid a slice of the prized beef directly onto the rock’s scalding surface for a few moments. I knew not to leave it on for longer than 10 seconds, to produce a deep, crispy sear on one side without completely destroying to beautiful wagyu beef. I then gave it an immediate dunk in the thin brown dipping sauce before popping the silky smooth meat directly it into my mouth. This may seem like a silly dish, and it kind of was. Hell, it really was just barely cooked beef with a touch of sauce and salt, but it was also really incredible. The texture of the gorgeously marbled beef was unlike anything I’d ever experienced before and that hot rock imparted just the right level of crisp to lock in the salt, pepper, and sauce. Silly? Maybe, but also very excellent. 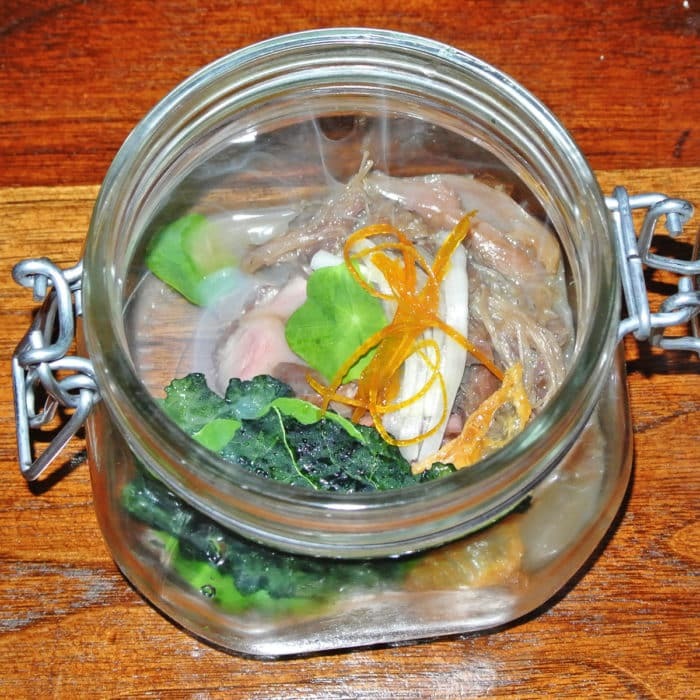 And then it was time for Uchiko’s arguably most famous dish called Jar Jar Duck. This is the dish you’ll find on nearly every Austin must-eat list. 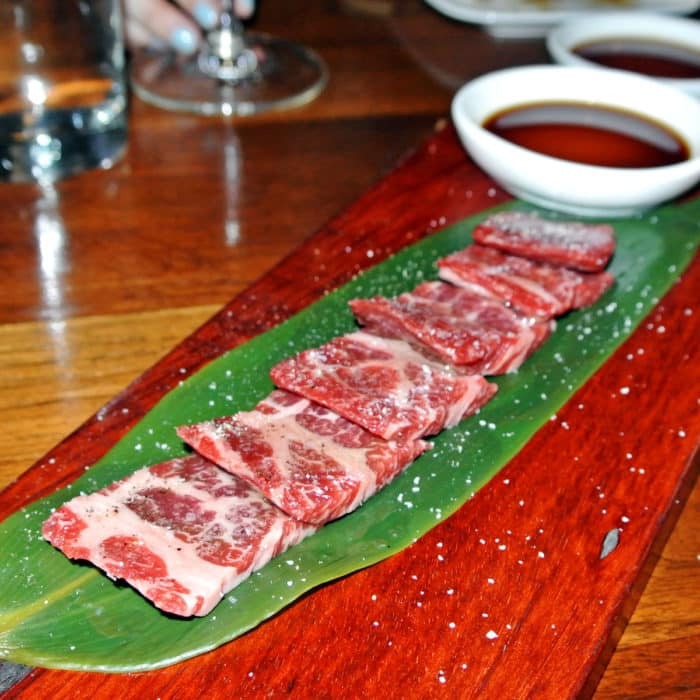 And despite its relatively high price, you’ll be more than likely to spot one on every single table at Uchiko. This strange dish was as much about showmanship as it was deliciousness. It involved a hinge-topped mason jar that was brought to the table completely sealed. Its contents were completely obscured by the dense cloud of grey, Applewood smoke that filled the vessel. Then, the reveal – the lid was popped open to allow the smoke to escape in an impressive and dramatic swirling, billowing cloud. Beneath the plumes were tender, shredded, Rohan duck pieces dressed with candied citrus, endive, and a variety of other greens. As cool as it was to watch the dish’s reveal, the bold flavors were just as remarkable. This was a very modern dish that was still tasted extremely homey, soothing, and comforting. 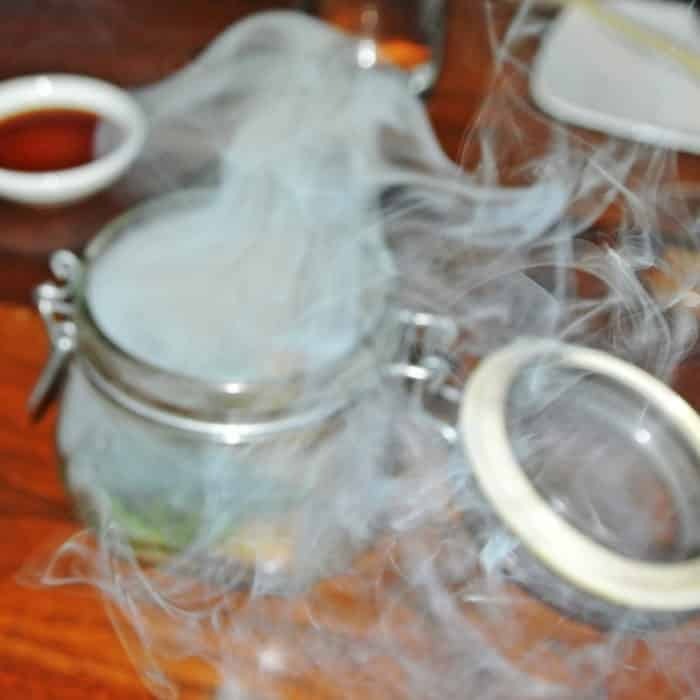 The smoke was definitely more than just a gimmick, and this dish is worthy of all of the press and praise it continues to receive. At this point in the meal, we were getting close to full, but we still wanted a few additional things to really round the meal out. Since Uchiko had fully gained my trust with everything they had already served, I ordered the strange sounding Maguro Sashimi and Goat Cheese ‘cool tasting’. This was another ceviche variation, this time with a much more drastic American-fusion edge than the previous two. 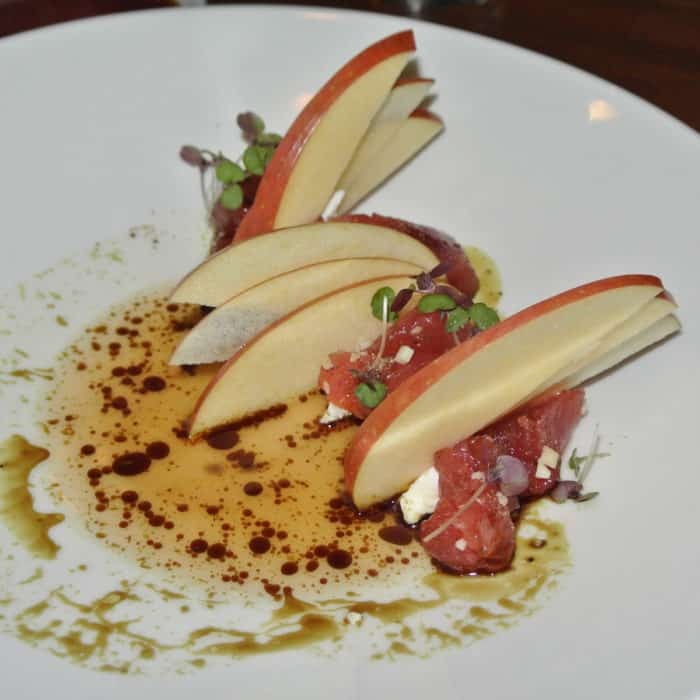 It involved big eye tuna plated beautifully with nutty pumpkin seed oil, rich and creamy goat cheese, and bright, crisp, fuji apple slices. This dish was unique, interesting, comforting, and still felt light due to its Autumnal flavor profile. 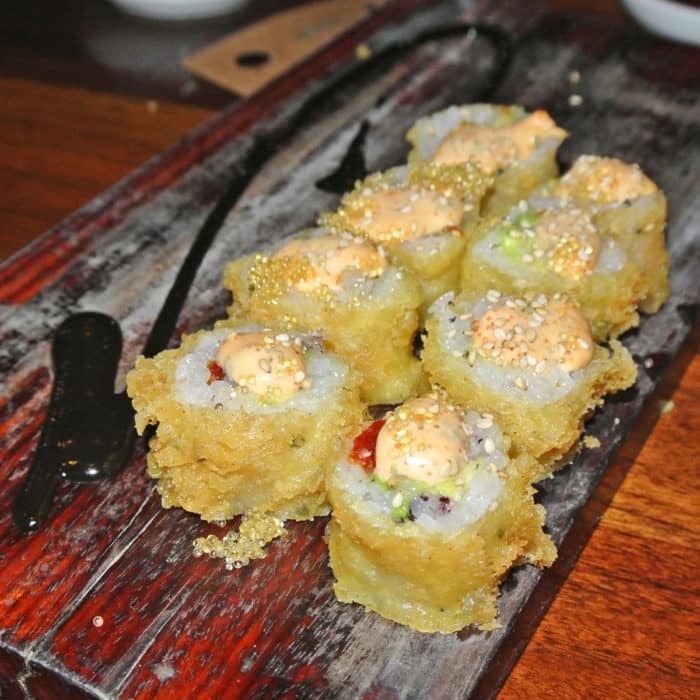 Additionally, we asked for a sushi roll called the Shag Roll. This roll involved placing salmon, avocado, sundried tomato, and sumiso (vinegar and miso dressing) into the roll before tempura battering and deep frying the entire thing. You’ve gotta be crazy if you’re doubting the deliciousness this innovative umami-bomb. Of course it was delicious. And to close out the meal, I ordered a dessert that I just couldn’t leave without trying. I had read enthusiastic tips online about the dish called Tobacco Cream and I ordered it full-well knowing that I was probably the only member of my dinner party that was going to enjoy it. What can I say – sometimes I’ve just got to be a little selfish. I didn’t care, this was a must for me. This meticulously plated, avant-garde dessert was truly unusual. 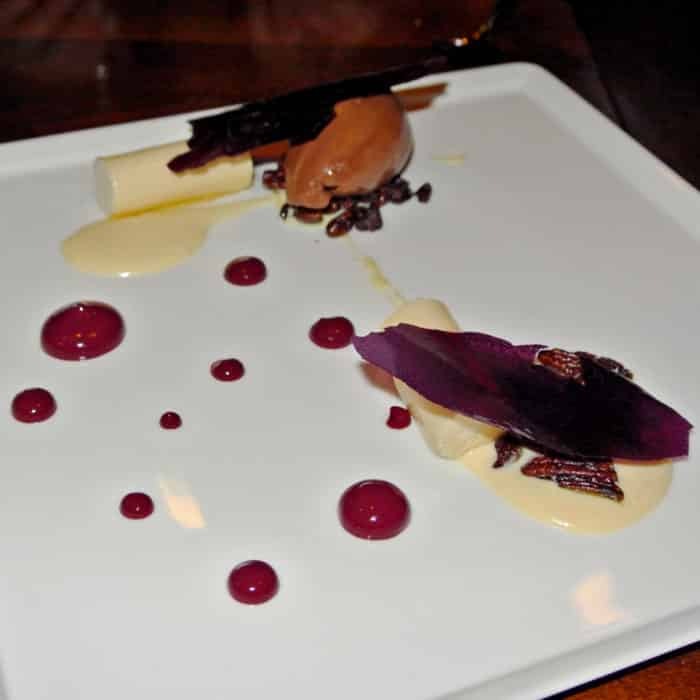 It was made with chocolate sorbet, huckleberry, scotch, and sort of pudding log called maple budino. It was SMOKEY – almost excessively so. It tasted kind of like eating an entire Cuban cigar dipped into a glass of peaty scotch which was then dunked into a vat of liquid chocolate. As gross as that combination may sound, I obsessively loved this wacked-out dessert. It was so insanely strange, but I really loved how this dish challenged my palette. In conclusion, Uchiko has proven that it’s worthy of all of the hype it’s generated. Paul Qui’s tenure at the restaurant has certainly left a lasting impression on the truly inventive Asian-fusion menu. So, even though dining at Uchiko doesn’t come for cheap, it really is one of the best restaurants in Austin. Got another must-go restaurant in Austin I should check out? Let me know in the comments below.